Recently, Rose Community Foundation’s Legacy Circle passed a significant milestone, growing to more than 100 members. The Legacy Circle is made up of individuals and couples who are relying on Rose Community Foundation to steward their charitable bequests and other types of future or planned gifts. “We are certainly honored and humbled that more than 100 people have entrusted us with this part of their charitable legacy,” remarks Vicki Dansky, senior gift planning officer. “We take that responsibility very seriously, and feel responsible not only to understand the donors’ intentions for how to direct the gift but to honor the history and values that have informed their decision to make the gift. That is why the Living Legacy Tapestry, which is hanging in our lobby, is such an important visual reminder of those values.” You can view a video about the Tapestry here. 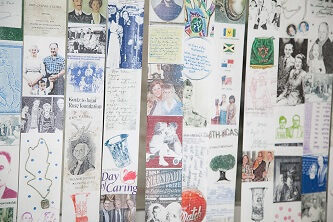 The Living Legacy Tapestry, composed by artists Leah Sobsey and Lynn Bregman Blass of visualhistorycollaborative.com, is an artistic archive of donors’ values. The artists were in Denver in mid-July and met with the new members of Rose Community Legacy Circle to include their representations on the Tapestry panels. 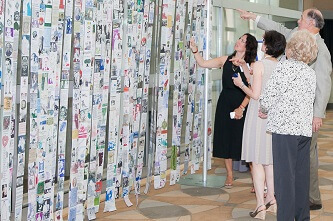 Guests view the Living Legacy Tapestry at our 20th anniversary event. Learn more about how Rose Community Foundation can help you or your clients create meaningful and lasting legacies here, or contact Patrick Sablich at psablich@rcfdenver.org or 303.398.7437. You can view a list of the more than 100 members of the Rose Community Legacy Circle here.